Enjoy the peaceful sounds of a tabletop fountain, sized to fit almost anywhere. Compact and lightweight, our hummingbird fountain features copper-colored metal blooms and metal leaves that have a green patina. 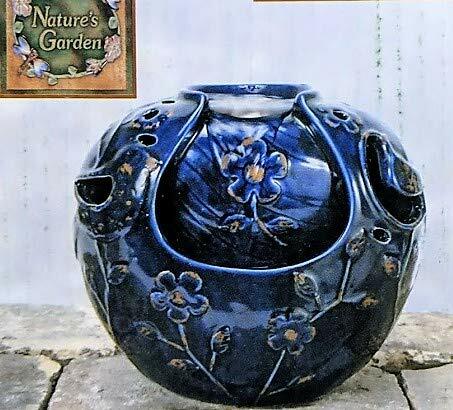 Water flows from the large flower to each petal and down into the black plastic bowl. Includes an adjustable UL approved recirculation pump with a 6' cord. Add rocks (not included) to the bowl for a more natural look. 8" diameter x 11" high. For indoor use only. Instructions included. Enjoy the peaceful sounds of a tabletop fountain, sized to fit almost anywhere. Compact and lightweight, our hummingbird fountain features copper-colored metal blooms and metal leaves that have a green patina. Includes an adjustable UL approved recirculation pump with a 6' cord. Add rocks (not included) to the bowl for a more natural look. 8 diameter x 11 high. For indoor use only. Instructions included. Peace & serenity exude from the reflection indoor table fountain. A rectangular base holds up a small archway that takes influence from pagodas, where three stones hang down at varying lengths. The archway features a wood grain finish, with soft arches that bring a relaxed look to the fountain. Hanging beneath the three stones, a large rock sits as a centerpiece where water bubbles from. 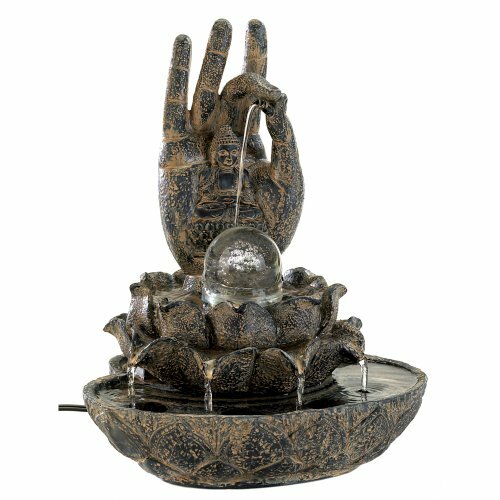 This water feature carries a heavy sense of symmetry to it, further bringing a sense of tranquility to the design of the fountain.at 22" tall, this table fountain will be perfect for your desktop or on a side table. Running water often brings a sense of calm to a space, which would be perfect for a work area where you re hammering out your latest essay or project. The soft trickle of water will keep you focused & relaxed while you work or get ready to settle down for the night. Along with the cool sound of water comes humidifying properties that help to keep dust down & your living space a little less dry! with the reflection indoor table fountain, you re sure to have a perfect blend of relaxation & style at your fingertips. Water can bring a sense of relaxation & refreshment to a space. & the spillway indoor table fountain can do just that. 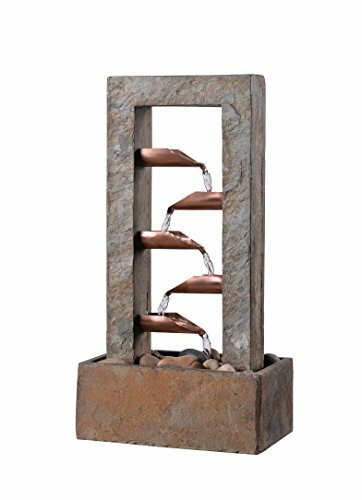 At 19" tall, this table fountain comes in a slate & copper finish that pairs for a nice warm color across the entirety of the water feature. Rectangles are the shape of choice here, with a rectangular base & archway making up the main body of the fountain. Inside of the archway, copper platforms allow water to run in a zig-zag pattern down into the River stone-filled basin, delivering the soft sound of flowing water. River stones: polished natural river stones add to the appeal. Accent your home with the subtle grace of this beautifully crafted fountain. 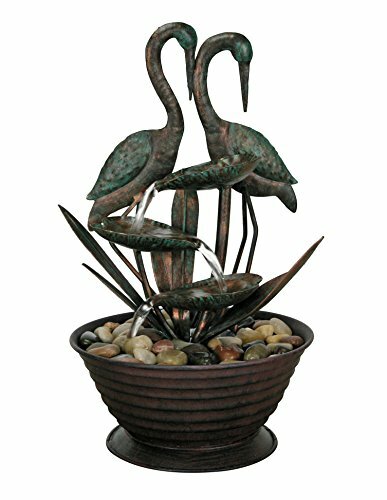 The gentle curve of the cranes will add tasteful elegance to your room and the gentle sounds of flowing water will inspire an atmosphere of calm contemplation. Settle down with your morning coffee and listen to the soothing cadence of water rolling over the smooth metal lily pads. Gently painted with deep shades of evergreen, it makes an ideal enhancement for sunrooms or studies. Bring a bit of Mother Nature into your home or give it as a memorable gift to a loved one. Is your life so boring that you want to be closer to nature's peaceful environment? Imagine that there is a sea of bamboo with a few birds flying by now and then, a small river running by, and you're sitting there, the wind ruffled your hair and you just forget everything but listening to the sound of a bird and a stream. Do you like it? Actually it is not far from you! 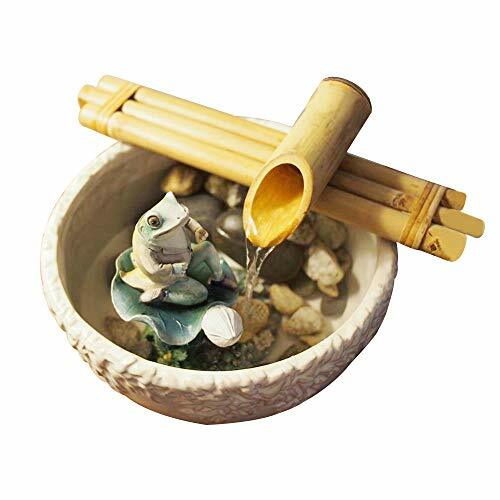 Take this bamboo fountain home, put the spout on a beautiful bowl, the energy in the room will be totally changed, you can hear the sound of water trickling in and the sound of it also reverb from the bowl itself. Makes a nice noise to add to the tranquility of a garden or a special spot in your home or office. Very flexible to suit your needs louder or softer is up to you. A large deep pot resonates loudly and a shallow bowl is quiet. Couldn't be more perfect! It looks and sounds very relaxing. You will look forward in the morning to listen to it. It is appealing to your dog and cat as well, they will love the fresh running water, and your bird friends will like to drink out of it!! Changing the water frequently before it gets nasty helps keep the little pump clean. Fountains have long been believed to hold restorative powers to soothe your spirit. This distinctive fountain features the sound of cascading water, soft glowing light, and striking architectural design that makes it a tranquil addition to your living space. 2W Submersible water pump included. This distinctive Cascading Water Tabletop fountain features the sound of cascading water, soft glowing light, and striking architectural design that makes it a tranquil addition to your living space. Fountains have long been believed to hold restorative powers to soothe your spirit. 80 long power cord. Submersible water pump included. 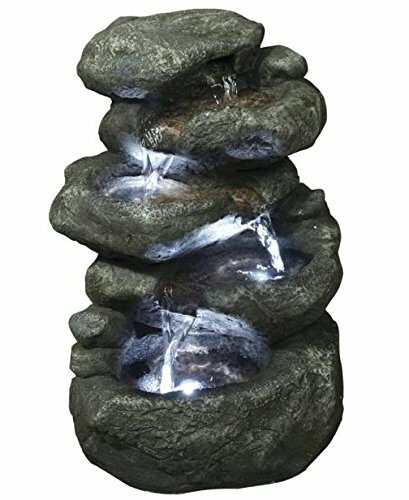 Enhance any setting with this enchanting fountain. 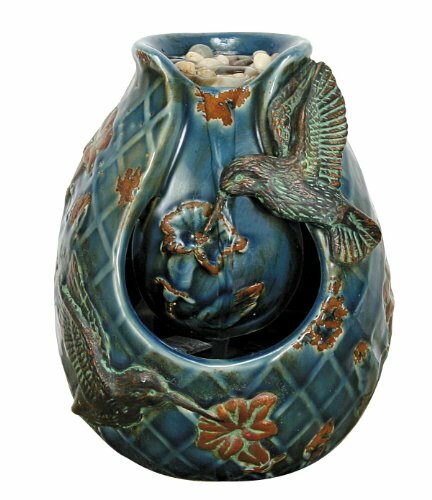 Attract admiring glances with the vibrant colors on this 7-inch tall fountain, from the aged green and brown of the raised hummingbirds to the blue latticework and ochre flowers. Perfect for any space, the hand-glazed porcelain fountain features river rocks in the top for water to cascade over. It blends nicely with any decor style, from country chic to formal modern, with its classic silhouette and lustrous colors. At just over 5 Inch in diameter, its ideally sized for an end table or wall shelf. 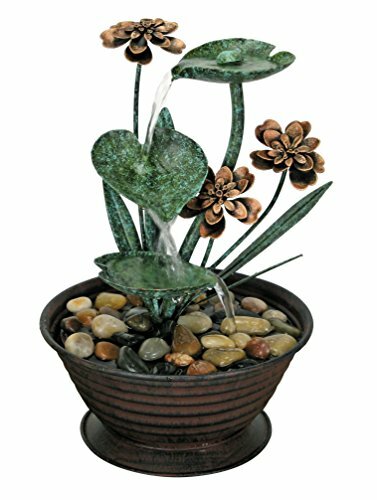 This tasteful water lily fountain pays homage to nature in earthy shades of russet and aged verdigris. The water cuts a flowing path over the curve of its leaves, filling the room with the delightful euphony of a woodland stream. Its deep, natural colors will bring an elemental sophistication to any room, richly accompanied by the neutral tones of the smooth stones. This fountain will look lovely amongst your indoor plants or in a study. Pick one up as a comforting get-well gift, or uplift the ambiance of your home office with the classic beauty of the water lily. Great Item To Give as A Gift. 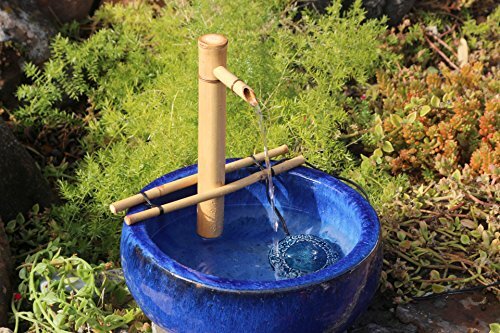 Handcrafted split free bamboo makes these unique water fountains a must have for any zen garden or home office. 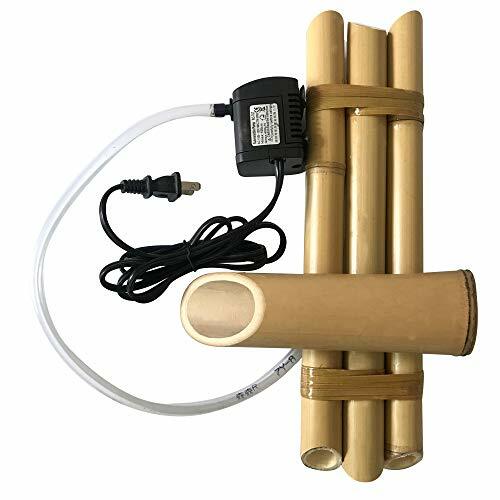 This complete kit contains tubing, submersible pump and bamboo fountain. 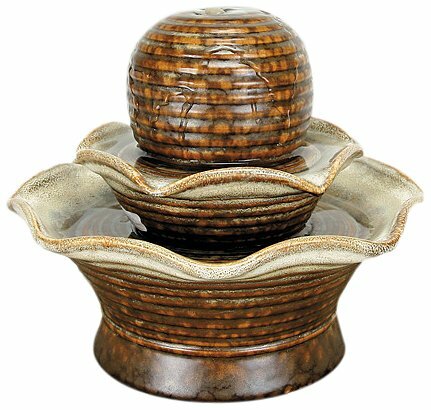 For 15 years, Bamboo Accents has specialized in the art of bamboo water fountains. Our quality and craftsmanship are unmatched. Each water spout is carefully hand-made in the tradition of ancient bamboo building, preserving techniques passed down throughout many generations. Affordable Elegance Add this minimalist garden accessory to an existing bowl to make for a bargain fountain. With easy setup you can have a custom center piece to your backyard garden that will stay around for years to come. Solid, Split-Free Bamboo While 99% of bamboo is hollow and prone to splitting, Bamboo Accents uses the only species that grows solid! This farm-grown bamboo is unique to a tiny region in Indo-China. While other bamboo species are not suitable for making high-quality bamboo fountains, the species that we use allows for a quality of craftsmanship that stands the test of time. 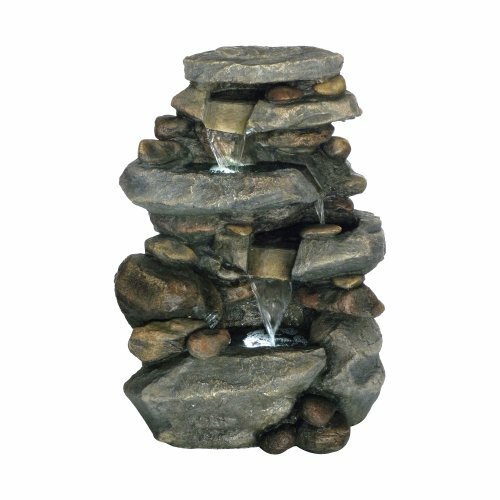 Great for DIY Fountain Whether your indoors or outdoors you can create your own zen paradise. Choose your favorite bowl to place at the bottom and surround it with stones plants or flowers. The end result is simple yet beautiful. ADJUSTABLE HEIGHT DESIGN: Fountain support arms can easily raise or lower to control the sound. Works functionally in a zen garden or home office. Fits on the edge of a 10" to 20" diameter bowl. EASY INSTALL: Complete kit includes submersible pump, tubing and bamboo fountain. Start hearing the calming sound of running water in just minutes. SPLIT FREE BAMBOO: Each spout is handcrafted from solid Tamvong bamboo by our artisans who have preserved the techniques of ancient bamboo craftsmanship for generations. FREESTANDING FOUNTAIN: Sleek, minimal and simple, this fountain rests on any size bowl with no extra fixtures. The three arm design is sturdy and made to last. 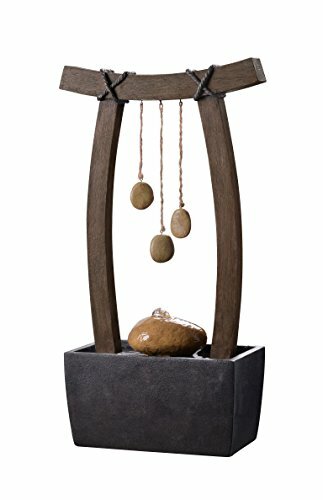 UNIQUE D COR: Spice up your zen garden or backyard with this DIY fountain. Pick and choose the color bowl you want to create your very own tranquil paradise. Elevate your landscape with the Hi-Line Gift Ltd. Wishing Well with Pouring Bucket Fountain with LED Light. It's carefully crafted from durable polyresin to have a realistic look. The interior pool is underlit and gives off an alluring glow in the dark. Dimensions: 17.25L x 15W x 26.25H in., 7 lbs.. Made from fiberglass and resin. For outdoor use. Bucket pours water into a wishing well. Includes LED light. Dimensions: 17.25L x 15W x 26.25H in., 7 lbs. Designed by our skilled artisans for the Nature's Garden Vintage Collection, the two-piece Brown Tiered Fountain brings elegant style to any room of your home. With fluid lines that echo the graceful flow of water, this fountain blends with your existing decor to add a relaxing touch. The tiered fountain features hand glazing in rich earth tones over durable, high-fired porcelain and is finished with an attractively distressed patina that accentuates its curves. Included with the fountain are a water pump with variable speed and an assortment of polished stones for additional character. 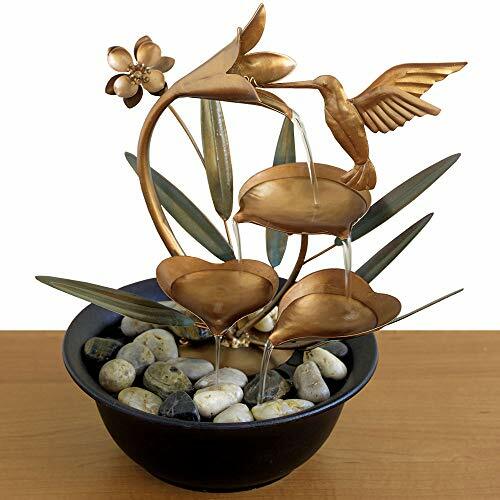 This is a gorgeous tabletop fountain from Nature's Garden. The color is a deep cobalt blue with amber accents. The design is called Bluebird because of the bird motif on either side of the fountain and there are beautiful floral designs repeated over the entire fountain. 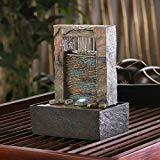 Measuring 7.5" x 4.5" x 7.5" the fountain comes with electric pump and stones (pebbles) and can be used indoor and outdoor. Made of ceramic with a shiny glaze finish. Absolutely stunning. This is a gorgeous tabletop fountain from Nature's Garden. The color is a deep cobalt blue with amber accents. The design is called Bluebird because of the bird motif on either side of the fountain and there are beautiful floral designs repeated over the entire fountain. 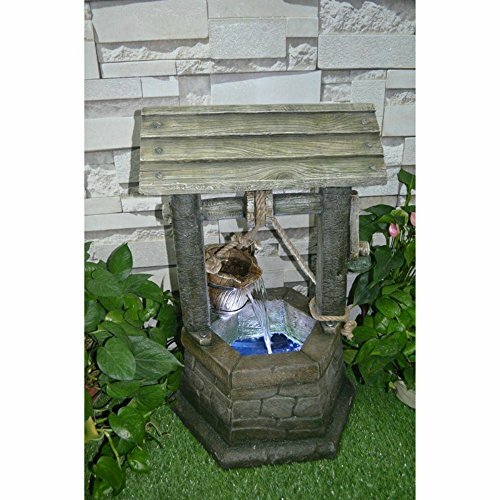 Measuring 7.5 x 4.5 x 7.5 the fountain comes with electric pump and stones (pebbles) and can be used indoor and outdoor. Made of ceramic with a shiny glaze finish. Absolutely stunning. 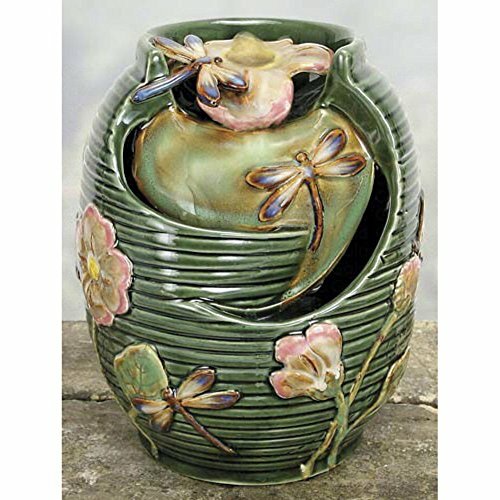 Place the Coynes Dragonfly Porcelain Fountain in your home or office for a calming accent piece. Crafted from ceramic and porcelain, this fountain features pebbles at the top from which the water flows down. Dimensions: 5 diam. x 6.75H in.. Features a dragonfly themed design. Crafted from ceramic and porcelain. Designed for indoor or outdoor use. Includes a 2 speed pump with on/off switch. Soothing accent piece perfect for home or office. Green colored finish. Dimensions: 5 diam. x 6.75H in. The soothing water sounds, natural look, and lighting ambiance of the LED Stone Waterfall Fountain by Pure Garden brings tranquility, relaxation, and beauty of nature to your outdoor living area. The outdoor fountain features a polyresin construction for weatherproof durability, LED lights, included pump with maximum flow of 120 gallons per hour, and is easy to set up for low stress assembly. Whether you place this fountain in your garden, on the patio, on your deck, or near the entranceway in front of your home, this lighted cascading waterfall is sure to bring an environment of peace and serenity, while leaving an elegant lasting impression! IMPORTANT: Avoid buying counterfeit products and transacting with unauthorized sellers. Look for our logo on the packaging for every one of our products. Pure Garden is committed to providing the consumer with the absolute best price and value on our entire line of products, which we ensure by applying a rigorous Quality Control process. DURABLE DESIGN- Enjoy your outdoor, lawn, garden, or yard d cor without worry. Made from sturdy polyresin material, this fountain is lightweight and weatherproof for longer lasting outdoor use. LOW MAINTENANCE AND EASY SET UP- The Pure Garden water fountains require no additional plumbing, stressful setup, or upkeep. Including a UL listed pump with 120gph maximum flow, all you need to do after assembly is fill it with the proper amount of water, and plug it in to a standard electrical outlet, and you are ready to enjoy the delightful sounds of nature. 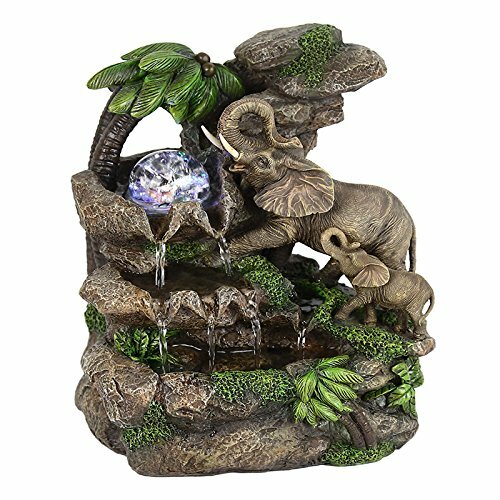 This beautiful water fountain adds the feature of the Matriarch Mother Elephant bringing its calf to the waterhole and to bring the power of Feng-shui to your room. When it is plugged in, water is pumped to the top of the fountain and make the crystal-like ball rotates and reflects the color changing LED light. It will begin to spin and roll, signifying the bringing of great wealth. In feng shui, running crystal presents to bring more good energy and running water stands for the arrival of wealth. Offers a relaxing yet elegant focal pt. For your yd. Fountain comes with mini water pump which needs to be connected to electricity for the water fountain to work. Fountain's small size helps it fit almost anywhere in your home.